Ever since she was two-months old Arya has loved playing with touch-and-feel books. She is now old enough to actually pay attention throughout entire books. But whenever we read a touch-and-feel book my daughter gets so distracted by the textured elements that she forgets about turning the pages and reading the book. Noodle Loves to Cuddle by Marion Billet has a fun touch-and-feel element on every page and Arya spent ten minutes playing with the book by herself after we finished reading it. The front cover of Noodle Loves to Cuddle shows a cute panda clutching a blue teddy bear. The teddy bear’s ears are a touch-and-feel element with soft, brown fur. Arya liked playing with the fur so I knew she would like playing with the rest of the book as well. Like most touch-and-feel books, Noodle Loves to Cuddle is short with only five pages. Each page has a unique textured item shown prominently on the right side: a duck with yellow fur; a purple ball with shiny, raised bumps; a telephone with rough, red tiling; a soft, blue blanket, and a shiny mirror. All of the touch-and-feel elements are bright and attractive to young children. Arya liked playing with all of them and she didn’t seem to have any discernible favorites. I was a little concerned about her ripping off the blue blanket since it’s only held to the book by one edge. But it stood up to her tugging and pulling without any noticeable tears. The reflective mirror at the end of the book was a delightful surprise for my little girl. She giggled when she saw herself in the mirror and proceeded to move around until she could see my face looking at her in the mirror. There is no logical story line as the book is more a random collection of touch-and-feel components. Text is limited to a short sentence on each page describing what Noodle the panda is doing with each object. 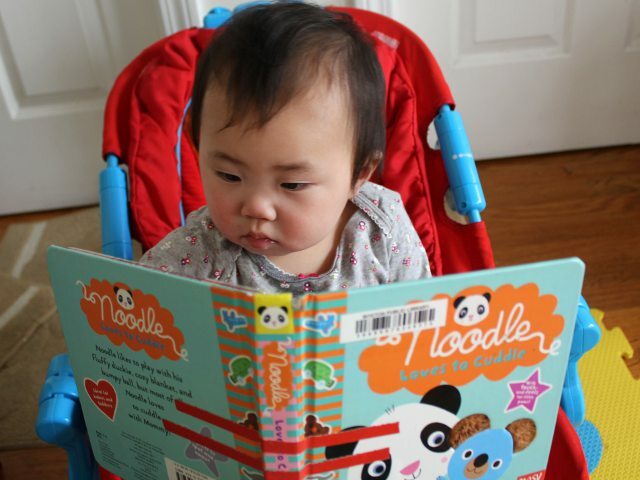 Noodle Loves to Cuddle is perfect for any baby who enjoys touch-and-feel books. The mirror at the end is particularly interesting for young children who are fascinated by reflective surfaces. Older children who have outgrown a love of touch-and-feel may still like reading the short text by themselves. Noodle Loves to Cuddle costs (including shipping) under $9 new and under $5 used from Amazon.